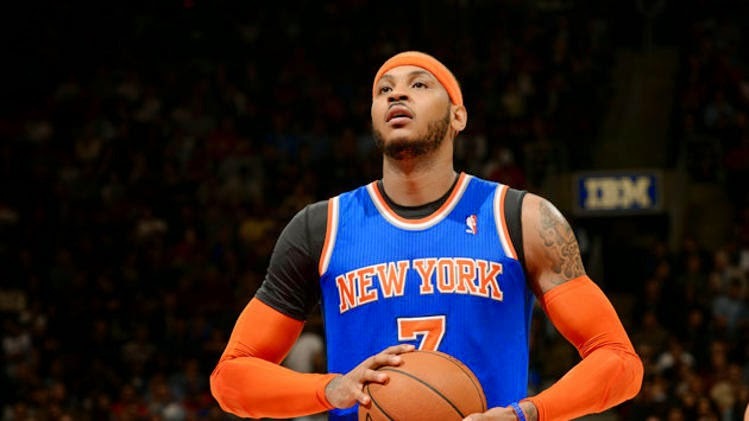 While LeBron James is heading home, Carmelo Anthony is staying put. Yahoo's Adrian Wojnarowski reported that Anthony will be re-signing with the New York Knicks on a five-year, $120 million contract after considering the Bulls, Lakers and Rockets. This comes a few days after the Daily News' Frank Isola reported that it was highly likely that Anthony would be returning to New York. So why is Anthony returning to the Garden? Hint: it's not all about the money. Now, nobody can think that money was not a factor. After all, $120 million is a significant amount of paper for anybody to consider and you would be hard-pressed to find somebody that would reject such an amount. The Knicks were able to offer more money to Anthony than anybody else and that did give them an advantage. But to say that Anthony is simply taking money over the chance of winning is completely unfair. Naturally, this talk has surrounded the Bulls' pursuit of him as most felt, including myself, that they offered him the best chance to win a title. But unlike New York (obviously) and Los Angeles, the Bulls were not in a position to offer Anthony max-like money without engineering a sign-and-trade with the Knicks. And the Bulls had pieces to offer the Knicks should they have wanted to make such a deal, and without having to deal Nikola Mirotic, as well as the Knicks not wanting to take back . Instead, the Bulls did not want to part with Taj Gibson and Jimmy Butler. Grantland's Zach Lowe nailed it when he wrote that if Chicago really wanted Anthony so badly, "maybe at the end you give up someone of real value." In other words, Chicago could have made a move that would have put them over the top to be a championship team, but instead held onto good, but not great, players in Gibson and Butler. In other words, it really is the Bulls that are not as serious about winning a championship by not being willing to make the necessary moves to bring in the kind of player that would have made them a title favorite. That is not Anthony's fault. And even then, the Bulls, who appear poised to land Pau Gasol at the moment, could find themselves in the Finals considering where the Eastern Conference is at. Plus, while the Knicks are not in a position to be anywhere near a championship team next year, at least they have got a guy by the name of Phil Jackson running the basketball operations and a highly regarded, if inexperienced, new head coach in Derek Fisher. And while we do not know the structure of Anthony's contract as of yet, he is taking a little less than the max and may have manufactured such a contract that allows the Knicks to have flexibility in going out and acquiring another star down the road. Did the Knicks overpay Anthony? They very well may have, particularly by the end of it. But the Knicks really did not have a choice. Stars help lure stars and it is very hard to land top players without having one in place. That is how the NBA works right now, for better and for worse. And while Anthony has his flaws, anybody who tries to claim he is not an elite player surely has some explaining to do. Money certainly talks, but it is lazy analysis to assume that it is the only reason why Anthony sticking around in Manhattan for a little bit longer.